Thinking of investing into Cryptocurrencies or Bitcoin but not sure how? You’ve heard of all the crazy success stories of teenagers becoming multi-millionaires and are gutted you didn’t buy Bitcoin last year when it was $700 and now it’s $6000? You’re concerned that this may all be a Ponzi scheme or a big bubble you’re too late to the party for? I personally have stated on record many times of my distrust for Cryptocurrencies between 2009-2016. However, my INVESTOR definition of being an idiot is stubbornly refusing to change your stance or opinion despite the environment and facts around you changing. Yes, I was an idiot of the highest order until last year. As a result, I’ve lost out on £5m profit from indecision and procrastination. So, like any successful investor, if you want to invest in something, first you MUST understand it. You need to learn what it is, how it’s created, how it flows, who plays with it, who has most to gain and lose and more importantly, how can you capitalise on the asset whilst safely mitigating risk…? If you don’t know these things, then you are simply gambling. Investors do not gamble. They may speculate on volatile assets using stats and fact and ‘low-risk-high-probability-outcomes’, but they do not gamble. So here is a free low-risk-high-probability-outcome for you. Bitcoin, Cryptocurrencies and more importantly the technology behind it, Blockchain, is here to stay. This IS the evolution of Money happening right in front of us and is as big as when Humans transitioned from Bartering to Coined Money. Is it all a Bubble? Yup. The biggest mankind has ever seen. The blowout will be spectacular. Does this mean you should steer clear? Definitely NOT! With events like this it’s extremely easy to profit from as the only constant in the history of over 5000 years of Markets is that despite an ever-changing world of variables, the only true constant is human nature. Now is the best time in your life to leap frog up in terms of personal net worth. Just like we had the Tech Bubble from 1997-2001, this is simply the Tech Bubble 2.0 from 2017-2021 perhaps. Regardless of the dates, it would be negligent of you to ignore this opportunity. So what should you do right now? You need to EDUCATE yourself! As a publicly trusted investor, business owner and educator, I have put together a vast amount of resources and training materials in the form of a Cryptocurrency Investing Crash Course combined with a buzzing private FB group where you can make friends with other positive knowledge and success hungry individuals to learn more and keep up to date from myself. This is a RAPIDLY moving market. Trust me, you NEED on-going support! It’s important you decide to take action and don’t dilly dally. I’ve just updated the whole course and increased the content and length. So at midday on Thursday 2nd November the course will increase to £197 instead of the £99 where it is now. Just go to www.TheRealisticTrader.com/cryptocourse and join the family. 1.1 Opening your 2 main Crypto accounts and why I use these. 1.2 The different types of wallet and understanding the basic processes of having and using a wallet. 1.3 Creating your Bitcoin Paper wallet. 1.4 Creating your Ether Paper wallet. 2.1 The differences between Money Vs Currencies. 2.2 What’s a Fiat currency and why nearly EVERYONE in the crypto space is mistaking cryptos for money when they are not. 2.3 What is a Blockchain, why it’s going to consume the world and why does it matter? 2.4 What are Cryptocurrencies, Bitcoin and how are they different to Paypal? 2.5 What the hell is a Smart Contract and the big buzz about Ethereum? 2.6 How much longevity is there in Cryptos and why do I think it’s not a fad? 2.7 How to really understand the big picture here with the Crypto Industry at the moment, what ICOs are and how to spot good Cryptos. 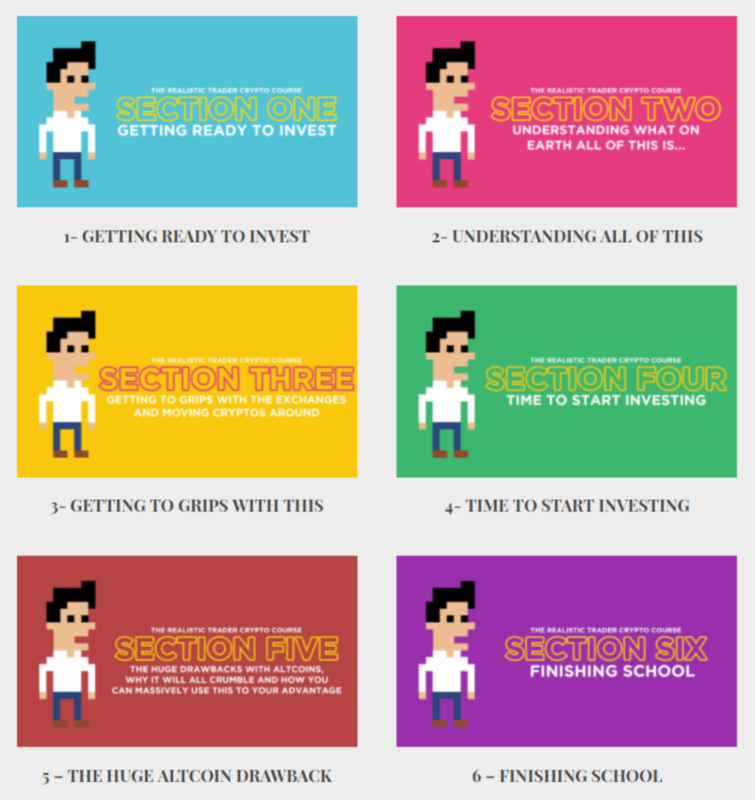 SECTION 3 – Getting to grips with the Exchanges and moving Cryptos around. 3.1 Re-cap of how to transfer GBP/EUR/USD to your crypto exchange. 3.2 Converting your GBP/EUR/USD into Altcoins (AKA buying your cryptos). 3.3 How to convert your Altcoins back into GBP/USD/GBP for when you want to extract some profit in the future. 3.4 Pinging your altcoins between exchanges. 3.5 Depositing and Withdrawing Bitcoin into and from your Paper Wallet. 3.6 Depositing and Withdrawing Ethereum into and from your Paper Wallet. 4.1 The 2 Crypto Strategies to nail this market and the importance of NOT trying to pick the winners! 4.5 Creating your NEO Wallet in order to claim your GAS! 4.6 OMG! Banking the Unbanked! 4.7 Cardano. The new Western Ethereum Challenger. 4.8 SAFEX. Possibly a future Blockchain based market place? 4.9 Setting up your portfolio tracking account so you know at a glance how your portfolio is doing. 4.10 How to invest in an ICO safely. 4.11 The best mobile app to stay current with Altcoin news & charting software for your phone to help identify buying opportunities. 5.1 The big problem with Bitcoin, what is a hard fork and why should you care? 5.2 The big problem with Ethereum. 5.3 The shady area for Ripple. 5.4 Being alert about Crypto MLMs. 5.5 A Caution for Crypto investors. 5.6 Be cautious about Mining. 6.1 Recap of the 2 Strategies and the basic flow chart of what to do. 6.4 Nick Szabo the Father of Cryptos. 6.5 Crypto Presentation to my Traders in Early 2017. 6.6 Diversification is for Idiots. 6.7 What the hell is Risk Capital & Cashflow? 6.8 Some questions from the FB Group. 6.9 Knowing when to exit and what’s next?